A structural geology and tectonics blog. For geologists, students and anyone interested in our planet Earth. a) Dip direction and dip angle: Dip direction is just the direction toward which the plane is inclined. Dip angle is the angle of inclination of the plane. In the example included in this article, we would write it down as 090/45; the plane is inclined 45º towards the east (090º). Easy. b) Strike and dip angle: Strike is the direction of the imaginary line which would represent the intersection between the plane and a horizontal surface. But here it comes the problem: the strike, as we know, can be represented by two different conjugated angles, and we need to follow some kind of convention; typically, the strike is expressed as the acute angle between the intersection line and the north direction. In our example, it would be 0ºN. But how which convention we take for indicating towards which direction is dipping the bed? For that we use the right hand rule. American right hand rule: Looking to the strike direction, the bed dips to the right. In our example, that would fit with 000/45. So, looking to the north, the bed dips to the right, to 090 (east). British right hand rule: The thumb of the right hand indicates the dip direction, and the heal points to the strike direction. So in our example, we would record the orientation as 180/45. That is: Strike towards 180 (perfect south bearing), and dip of 45º towards 090. Which would mean, no doubt, a strike of 180 and a dip direction towards the east, with a magnitude (dip angle) of 45. If you use strike, please remember to write always as a companion of the dip angle the quadrant where the dip direction would be. For example, 045/56SE. In this case we are talking of 135/56 (dip direction/dip angle). 045/56NW; now we would be talking of 315/56 (dip direction/dip angle). What does that mean? I have seen it. Does it mean 45º from north towards west, so 315? or does it mean strike of 045 and an a dip angle of 34 towards W? Is that? Uh, I don't think so. The truth is that, besides right-hand rules, many geologists use other conventions, sometimes personal ones, and maybe in a wrong way. Perhaps using only NW and NE quadrants for the strike. Perhaps not. When we speak of general trends in a big area (e.g. an orogen, in order to show that a trend is parallel or not to the structure). In a mine, in order to visualise quickly if the strike direction is the same as certain mineralisation or lineaments. In engineering geology, for the same reason, in order to know if the bedding/joints have the same orientation than a well, a tunnel, etc. I would suggest another right hand rule... If you use strike for describing the attitude of a plane, your right hand should be cut!. But perhaps that is very extreme... so far. I second your new right hand rule, off with the strik! ummmm ...doesn't your image show a WEST dip, even though the "dip direction" label points to the east....? Paul, the graphic refers to the first example: A plane dipping 45º towards E, so, 090º. I agree with Paul. Its dipping west. The dipping plane is the pink PLANE. The green VOLUME shows the relationship between the plane and the horizontal reference. It dips East. Clearly people don't have 3D minids. The dip and the strike refers ALWAYS to a plane (pink) not to a volume. For God's sake, are you really geologists???
" For example, 045/56SE. In this case we are talking of 120/56 (dip direction/dip angle). 045/56NW; now we would be talking of 315/56 (dip direction/dip angle). Wouldn't it be 135/56 instead of 120/56? Your British right hand rule is incorrectly stated, the index finger of the right hand points to (in) the strike direction not the heel. See Raglan 2009. Maybe to avoid confusion the American right-hand rule should be called the left-hand rule! Can anyone explain the benefits of thinking in terms of strike-dip opposed to normal vectors to a plane? With normal vectors, one can visual the plane at least as easily, and there are a lot better tools to work with vectors opposed to strike and dip notation. LOL, love the idea of cutting of right hand!!! This has been a significant problem world wide, for years!!! Many experienced geologists do not realize the confusion... I suggest that whatever you use, WRITE IT AT THE FRONT OF YOUR ALL OF YOUR FIELD BOOKS. From experience, I insist that all geos who work for me use dip and dip direction to avoid confusion. Thanks for the post and explanation. A quick google image search returns images that describe these 2 different versions of the "right hand rule", which means exactly as you stated that it is not used the same universally. This kind of confusion is exactly why I teach students that dip always involves 2 components: 1) dip angle; and 2) dip direction. I think the concept of strike is still a very valuable one and prefer it over a precise dip azimuth. The concept of dip dip direction is good, but where there is a vertical plane, the strike/dip concept holds more. I think the image needs a note specifying the cut cubic green figure is the reference horizontal body. Learn about quadrantal bearing and whole circle bearing from the following link. 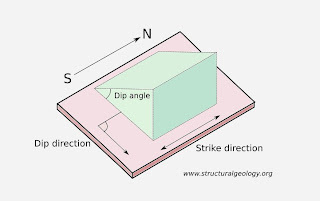 If the orientation of rock stratum is recorded as 240°∠30°, how much is the strike, dip direction and dip angle, respectively?